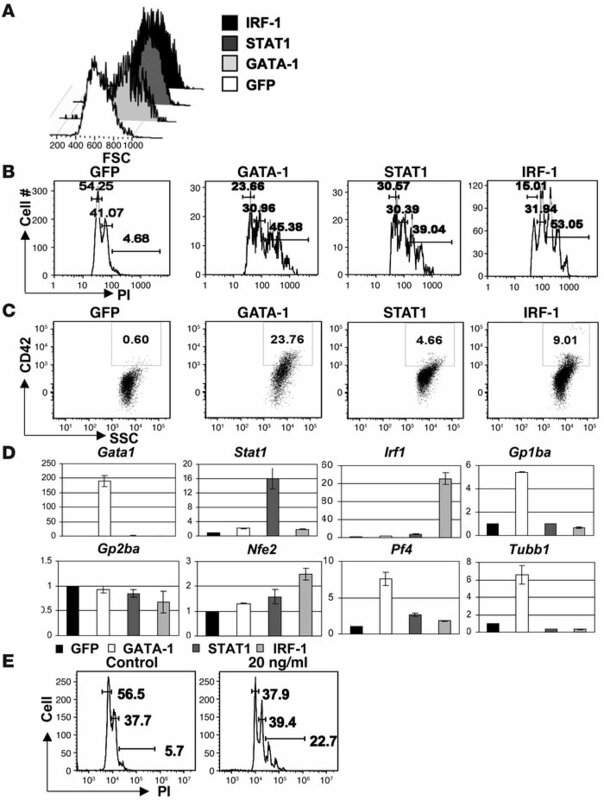 STAT1 signaling promotes megakaryocytic differentiation in G1ME cells. (A) G1ME cells were transduced with retroviral constructs expressing GFP alone or bicistronically expressing GFP plus GATA-1, GFP plus STAT1, or GFP plus IRF-1. Two days after infection, transduced cells were collected and megakaryocytic differentiation was assayed by flow cytometry. A gate was set on GFP+ cells. The cell size was measured with forward side scatter. (B) The polyploidy of transduced cells was analyzed by staining with propidium iodide (PI). (C) Cell-surface expression of CD42 was determined by staining with PE-labeled anti-CD42 antibody. (D) The expression of lineage-specific genes in the transduced G1ME cells was detected by quantitative RT-PCR. (E) G1ME cells were also treated with or without 20 ng/ml of IFN-γ for 3 days. The polyploidy of treated cells was measured by staining with PI and analyzed by flow cytometry. Data are representative of 3 independent experiments with similar results.